KIEV, Ukraine -- As Ukraine's recently elected President Viktor Yanukovych prepares to visit Washington in April, he will aim to project an image of stability, confidence, and control. In reality, Mr. Yanukovych has committed a series of mistakes that could doom his presidency, scare off foreign investors, and thwart the country's modernization. Mr. Yanukovych's first mistake was to violate the constitution by changing the rules according to which ruling parliamentary coalitions are formed, making it possible for his party to take the lead in partnership with several others, including the Communists. That move immediately galvanized the demoralized opposition that clustered around his challenger in the presidential elections, former Prime Minister Yulia Tymoshenko. His second mistake was to appoint as prime minister his crony Mykola Azarov, a tough bureaucrat whose name is synonymous with government corruption, ruinous taxation rates, and hostility to small business. The appointment dispelled any hopes Ukrainians had that Mr. Yanukovych would promote serious economic reform. His third mistake was to agree to a cabinet consisting of 29 ministers as opposed to 25 before—an impossibly large number that will only compound its inability to engage in serious decision making. That the cabinet contained not one woman—Mr. Azarov claimed that reform was not women's work—only reinforced the image of the cabinet as a dysfunctional boys' club. His fourth mistake was to appoint two nonentities—a former state farm manager, and an economics graduate from a Soviet agricultural institute—to head the ministries of economy and finance. Meanwhile, he created a Committee on Economic Reform, consisting of 24 members, to develop a strategy of economic change. The size of the committee guarantees that it will be a talk shop, while the incompetence of the two ministers means that whatever genuinely positive ideas the Committee develops will remain on paper. His fifth mistake was to appoint the controversial Dmytro Tabachnik as minister of education. Mr. Tabachnik has expressed chauvinist views that democratically inclined Ukrainians regard as deeply offensive to their national dignity, such as the belief that west Ukrainians are not real Ukrainians; endorsing the sanitized view of Soviet history propagated by the Kremlin; and claiming that Ukrainian language and culture flourished in Soviet times. Unsurprisingly, many Ukrainians have reacted in the same way that African Americans would react to KKK head David Duke's appointment to such a position—with countrywide student strikes, petitions, and demonstrations directed as much at Mr. Yanukovych as at Mr. Tabachnik. These five mistakes have effectively undermined Mr. Yanukovych's legitimacy within a few weeks of his inauguration. The 45.5% of the electorate that voted against him now feels vindicated; the 10-20% that voted for him as the lesser of two evils now suspect that their fears of Mrs. Tymoshenko's authoritarian tendencies were grossly exaggerated. And everyone worries that Mr. Yanukovych and his band of Donbas-based "dons" are ruthlessly pursuing the same anti-democratic agenda that sparked the Orange Revolution of 2004. Several other key dismissals and appointments have only reinforced this view. The director of the Security Service archives—a conscientious scholar who permitted unrestricted public access to documentation revealing Soviet crimes—has been fired. The National Television and Radio Company has been placed in the hands of a lightweight entertainer expected to toe the line. Most disturbing perhaps, several of Mr. Yanukovych's anti-democratically inclined party allies have been placed in charge of provincial ministries of internal affairs—positions that give them broad scope to clamp down on the liberties of ordinary citizens. Democratically inclined Ukrainians are increasingly persuaded that Mr. Yanukovych wants to become Ukraine's version of Belarus's dictator, Alexander Lukashenko. But Mr. Yanukovych's vision of strong-man rule rests on a strategic, and possibly fatal, misunderstanding of Ukraine. First, the Orange Revolution and five years of Viktor Yushchenko's presidency empowered the Ukrainian population, endowing it with a self-confidence that it lacked before 2004 and consolidating a vigorous civil society consisting of professionals, intellectuals, students, and businesspeople with no fear of the powers that be. Mr. Yanukovych's efforts to establish strong-man rule already are, and will continue to be, resisted and ridiculed by the general population. Second, Ukraine's shambolic government apparatus cannot serve as the basis of an effective authoritarian government. Tough talk alone will fail to whip a bloated bureaucracy into shape. Worse, Ukraine's security service and army are a far cry from those in Belarus. Mr. Yanukovych may try to emulate Mr. Lukashenko, but without a strong bureaucracy and coercive apparatus, he will fail. 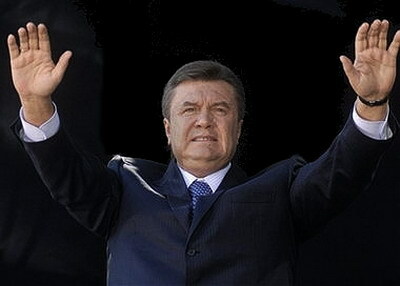 Third, with an ineffective cabinet, all decision making will be concentrated in Mr. Yanukovych's hands. Even if one ignores his deficient education and poor grasp of facts, Mr. Yanukovych's appointment of Mr. Tabachnik demonstrates that Ukraine's president is either completely out of touch with his own country, or arrogantly indifferent to public opinion. Fourth, Ukraine is still in the throes of a deep economic crisis. If Mr. Yanukovych does nothing to fix the economy, Ukraine may soon face default, and mass discontent among his working class constituency in the southeast is likely. If Mr. Yanukovych does embark on serious reforms, that same constituency will suffer and strikes are certain. So negotiating the crisis will require popular legitimacy—which Mr. Yanukovych is rapidly squandering; a strong government—which he does not have; and excellent judgment—which is also missing from the equation. Indeed, if Mr. Yanukovych keeps on making anti-democratic mistakes, he could very well provoke a second Orange Revolution. But this time the demonstrators would consist of democrats, students, and workers. The prospect of growing instability will do little to attract foreign investors, while declining legitimacy, growing incompetence, and tub thumping will fail to modernize Ukraine's industry, agriculture, and education. Mr. Yanukovych could very well be an even greater failure as president than Mr. Yushchenko. Although the outlook is grim, it is not yet hopeless for Ukraine's new president. He could still grasp a modest victory from the jaws of an embarrassing defeat by ruling as the president, not of Donetsk, but of all Ukraine. All he has to do is restrain his appetite for power and learn to rule with the opposition and with the population. It's not so complicated—it's democracy.